According to the fractal I posted earlier I expected a rally... but not that huge a rally! Up 2,6 % and back at 1100. What a day! I've already posted this fractal, I think it was early April, but I've lost track of it until yesterday, when I looked at it again and saw that the correlation between mid 2007 and today is still impressive. If this played out the target would be 1240-50 at the end of July. Quite pointless actually to post an EW count since we're right below 1103. 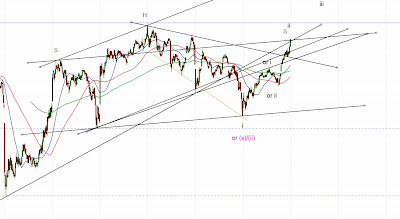 Break above that level and the short term bearish count (wave i finished at 1070 (exp. leading diagonal) and wave ii ended EOD today (quite common for a second wave to retrace almost everything of an LD)) is toast and either wave [ii] is still ongoing or the correction ended at 1040 and we'll see new highs in summer.